In the first part, I began with a presentation and discussion of H.G. Wells’ story, The Shape of Things to Come, and the movie script which adapted and modified the story. 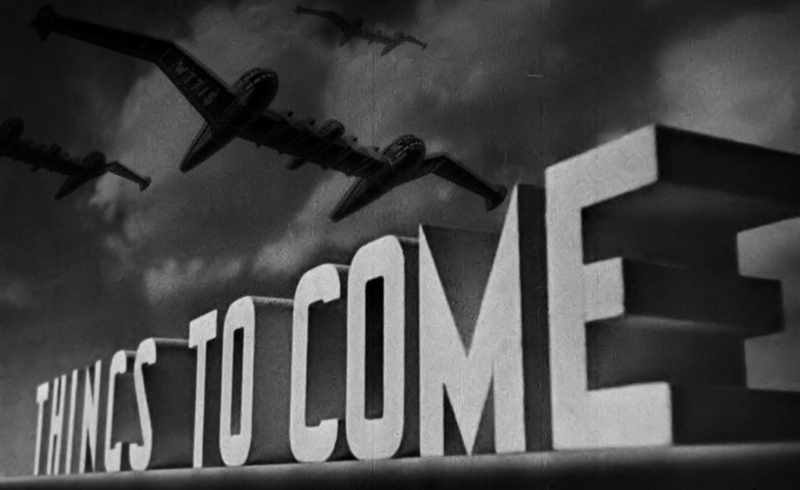 In the 1936 movie a character who calls himself “Wings Over the World,” member of a body naming itself the “United Airmen,” and who claims to be part of a government which he calls “World Communications,” flies down to a destroyed city to announce to the wretched denizens his plans for their salvation. As the ultimate globalist, announcer of a new world order, he also strikes the pose of the humanitarian civilizer, come down to conquer the unruly natives, for their own good of course. There is no sense that he has anything to gain, apart from a highly contrived sense of his own superiority. This is a pretty picture, when compared to our world. In our world, Mr. Wings Over the World is not removed as a party to the destruction. He does not, by pure happenstance, come upon devastation, as if he had been until then a remote spectator. In our world, Mr. Wings Over the World first drops the bombs that obliterate the nation-state, and then lands to make lofty speeches about our impending “transition”. The United Airmen first bring chaos, and then pave it over with their self-serving plans. Tabula rasa is the new terra nullius, which is then the material and ideological base for a “new world order”. There is too much to support theses of “creative destruction” to pretend not to understand that chaos is opportunity. If you accept the premise that chaos is opportunity, then you must be prepared to admit the logical consequence: that destruction may be deliberate, a “failure” by design. The only “unintended consequences” or “blunders” here are in not correctly calculating or estimating how far things would get out of control, how many other parties would capitalize on chaos, and that rewards would not be instantly reaped. Otherwise, on the economic front, provoking the collapse of others affords opportunities for increased military spending, thus furnishing the “defence” industry with further contracts, which then provides their partners in government a “cut” in the form of campaign donations and eventual positions of employment—we should know a great deal about the military-industrial complex (Eisenhower) and the power elites (Mills) by now. On the political front, chaos visited on others lays them bare to our planning their future, thus forcibly opening them to investments of all sorts. Ideologically, the chaos of the other vindicates our own sense of self-worth as superior, helping to cement a domestic constituency of support after it has been flattered about its own virtues and rendered proud and confident, in themselves and in their leaders. Disunity abroad can be turned into a call for unity in the centre of empire, a call to show “leadership” and to establish “order” in the name of “our vital national interests”. But others have to be rendered interesting first. The recolonization thesis becomes evident in the defining speech heralding the “new world order,” delivered by then US president George H.W. Bush in 1990. In that speech, when Bush himself repeatedly spoke of ushering in a “new world worder” in the context of the US-led military assault on Iraq, he also made another curiously worded statement: “We’re now in sight of a United Nations that performs as envisioned by its founders”. When the United Nations was founded in 1945, in San Francisco, by a mere 50 states (it now has 193 members), most of those were European states and several of them were colonial powers. To return the UN to such roots, is to implicitly yearn for its colonial origins as an elite club (plus some fully Eurocentric-led Latin American states). What Bush is also reminding his listeners in 1990, was that the UN had been forced to surpass its headier days of anti-colonialism, of calls for a New International Economic Order, and of a UNESCO devoted to bringing about a New World Information and Communication Order aimed at undoing US cultural imperialism—all of which provoked the righteous white anger of US presidents such as Reagan and GHW Bush. They railed against UNESCO, defunded it, and helped to quash its impact. This is the UN that is now performing as originally desired (see also Cammack, 2006). “There is a lot of sort of beginning sprouts of such an opposition. But there’s no address for the opposition. There is no place that any of us who wish to assist can go”. Here was a case of an address in search of a government, another way of forcing fiction to become reality. Concerning Libya, the situation involves a newly invented third government, in search of a Libyan address. Here I am speaking of the misnamed “Government of National Accord” (GNA), which is neither a government, nor was it the product of a national accord. Imagine that: a “government” fabricated behind closed doors in meetings between the US, EU states, and regional powers, then announced from up high to Libyans as their new government, which they are encouraged to support, to pretend as if it was their own, while it remains externally located (in a luxury hotel in Tunisia). As if not expecting anyone to raise an eyebrow, let alone a question, the UN’s Libya envoy, Martin Kobler, declared: “We must advance on the political process by installing a government in Tripoli”—the UN is now in the business of installing governments. In 2011, the UN spearheaded regime change in denying the Libyan government the right to represent itself at the UN, in a series of fundamental violations of international laws that are at the very core of the UN…but which obviously were never meant for the decolonized, who mostly did not exist when the UN was founded. All of this talk of a new government has thus come from the same international leaders that so confidently declare, in final and absolute terms, how this or that national leader “must go,” and has “lost all legitimacy”. Again, from the same figures that speak of “democracy promotion”—we have a government which no Libyan elected, or even selected. The same path toward a manufactured fiction of governance was pursued by the US and NATO in Afghanistan, in creating Hamid Karzai as president, and then later applauding the “courageous will of the Afghan people” for allegedly “voting” in elections rife with fraud on a massive scale, when millions more “Afghans” than were registered turned out to “vote”. The same was done in Iraq, so that it could be claimed that an Iraqi government “agreed” to the sweeping neoliberal transformations unilaterally imposed by Iraq’s US dictator, Paul Bremer of the “Coalition Provisional Authority”. No wonder then that the forces backing the General National Congress, in Tripoli, announced their intention to arrest any members of this new third government should they set foot in Libya. No wonder also that reportedly many Libyans refer to this UN mandated fiction as “the foreign government”. Science fiction, masked as US foreign policy and UN resolutions, seems to really come to light when “governments” are created, “recognized” and installed, while possessing none of the qualities that define a government—no territory to govern, no local roots, no local history, and above all, no sovereignty. Though they may be unbelievable as governments, this should not distract from what is instead quite credible: these inventions form part of the new global (re)colonial regime. As suggested in the last section, apparently nothing bothered imperial powers so much as decolonization—and they had every intention of clawing it back and finding new ways of reimposing colonialism. “The last thing in the world you want is a false caliphate with access to billions of dollars of oil revenue,” US Secretary of State John Kerry said earlier this month. Then The New York Times notes in a matter of fact manner: “there is no functioning government now in Libya”. So how is the caliphate “false,” when it is compared to something which is absent? In fact, one would be hard pressed to find a well-substantiated source that is able to convincingly explain, first, how the Islamic State came to create a base in Libya, and second, how it has been able to entrench itself and spread with such speed. What dominates the mind space instead are the sorts of circular arguments advanced by The New York Times and by the US government: “forming a unity government could lay the groundwork for the West to provide badly needed security assistance to the new Libyan leadership”. In other words, install a government so that you can send aid to this fictitious entity, so that it can do the bidding of foreign powers. It’s bad science fiction because it is too transparently false and not even remotely credible—and the self-serving nature of the exploitative relationship, is only able to produce a parody of international law to justify itself. We are not dealing with the first time that the the US has tried to invent a government for Libya. Somewhat unlike “Wings Over the World” in part 1, who declared that the intentions of his “government” (“World Communications”) is to put an end to sovereignty, the US will not end it outright so much as invent it almost out of thin air. The US announced that the Jamahiriya led by Muammar Gaddafi had “lost all legitimacy”—but in the face of what exactly had it supposedly “lost” its legitimacy? Confirming what we already knew and understood, retired CIA operative Tyler Drumheller wrote various memoranda to Sidney Blumenthal—Hillary Clinton’s private advisor on Libya in 2011—which showed just how foreign powers helped to concoct the opposition “government” [the National Transitional Council, or NTC] that they would then recognize as the “legitimate representative” of all Libyans. This recognition was offered in spite of the fact that neither during the “rebellion,” nor as plainly demonstrated after 2011, did such legitimacy ever exist on the ground. Had they been the legitimate representatives of all Libyans, then we would not have the “failed state” of today. However, that realization makes an awful lot of regime changers and humanitarian imperialists distinctly uncomfortable, because it suggests a flip side: that what was forcibly overthrown, and had existed for 42 years (a record lifespan that Libya is unlikely to match again), must have had a solid base of legitimate representation. Either way, those for whom the fiction of legitimate governance was invented, are today on the receiving end of the same process that instituted them—they are being uninvented by a reinvention. It is difficult to find any writer publicly commenting, let alone explaining, a fact that should be painfully obvious to the world right now: the United Nations of the “new world order” has failed miserably to achieve any reality for the illusion that Western liberal democracy would be transplanted to subjugated populations around the world, and take root. No roots, only routes to the nearest emergency exit: the irony is that the last two letters in UNSMIL are themselves untrue—it is no longer in Libya. UNSMIL was forced to leave Libya in 2014 over the violent failure of the costly myth it had peddled to the world’s taxpayers who support it. “Transition to democracy”—this was the phrase repeatedly produced by UNSMIL to described Libya post-2011. In 2012, UNSMIL said it was committed “to assist and support Libyan national efforts to undertake political dialogue, promote national reconciliation and embark upon the electoral process”. The “democratic transition and electoral process” were, together, UNSMIL’s stated top priority. “The Secretary-General urges all Libyans to stand together in a spirit of reconciliation; to insist that a revolution in the name of human rights must not be tarnished by abuses but must bring about justice through rule of law; and to ensure that women, youth and civil society as a whole are encouraged to play their full part in the development of transparent, inclusive and accountable institutions. The transition to democracy is a period of great challenges, but it is also a time of opportunities to build a new Libya that honors the sacrifices of its people in their struggle for freedom”. While many speak of a “failed state” in Libya, fewer speak of “failed inter-state organizations” such as the UN in Libya. The UN imposed itself in the role of supporting “democratic transition” and “democracy promotion” in Libya, of building a state based on the “rule of law,” in part through its instrument on the ground, UNSMIL, and through other key agencies, such as the UNDP (United Nations Development Programme). The UNDP was especially active in Libya, investing $30 million in support for the electoral process (which ended up in ruin, with negligible turnouts), supporting the National Transitional Council and the National Congress, supporting the constitutional process, allegedly strengthening institutions, public administration, accountability and transparency, and supporting “civil society” and “civic engagement”. The UN’s program was, in ambition, in the same tradition as the artificial, externally-imposed, package of neoliberal transformations that the US occupation authority tried to impose on Iraq. The UN also played a vital diplomatic, media, and legalistic role of its own in ensuring regime change in Libya. In recent years, the UNDP adopted the practice of writing partial, partisan attacks on the former government of a member state in articles on its website, such as this one filled with hyperbole and falsehoods bundled into a single sentence: “Four decades under the rule of one of the harshest authoritarian regimes in the Arab region have left no chance for Baba and her peers to learn about democracy and good governance”. In striking contrast, the UNDP site contains no visible evidence of the termination of its role in failure, how it failed on so many fronts, and why, nor an account for how it foolishly wasted millions of world taxpayers’ dollars on a project of social and political engineering, the likes of which were known only under former colonial rule. For all of 2015, the news was filled with repeatedly premature announcements that a new “peace plan” had been agreed upon in Libya, with a new government of national unity to replace or subsume the two main competing governments (the General National Congress in Tripoli, versus the House of Representatives in Tobruk). Each time, the news turned back to announcing that the latest new deal had been rejected by one or both parties. Then in December, a new Government of National Accord was triumphantly declared by the UN and the US. It’s not even a government based in Libya—in fact, it is not even allowed to enter Libya, under threats of arrest from GNC backers. So we were then told the GNA would “soon” be formalized—except that it was immediately rejected by the parliament in Tobruk. The new government, a revised version of the GNA, would be formed “within the next 10 days” we were told in January. By February, an extension of an “extra week” was sought. As the Libya correspondent for The Guardian noted, “this is an extension of an extension”. At the time of writing, yet another extension was introduced, and UN’s Libya envoy, Martin Kobler, sought to publicly pressure Libyans to hurry up. Facing the possibility of further extensions, foreign powers (the US and leading EU states) have increased pressure on Libyans to accept the foreign-backed “unity” government, under the threat of sanctions. “There is no time to lose for the national unity government to assume its functions and securely establish itself in Tripoli,” the newly appointed French Foreign Minister Jean-Marc Ayrault asserted imperiously, warning that anyone “obstructing the process” would face international sanctions: “That point is clear”. “Parachuting a third ‘government’ into Libya by Western vote is pretty bad. But, as things tend to be in the region, the UN action is actually far worse than it appears. First, the newly approved UN plan is the exact plan devised and announced by former UN envoy Bernardino Leon – who was caught accepting a high-paying job from a country which was arming, funding and fighting with one side of the Libyan conflict. The same Leon who told his future employers that one of his goals was to ‘discredit’ one of the existing Libyan governments. Compounding a bad situation, in response to the Leon scandal, the UN has not only refused to even acknowledge the conflict of interest and corruption of their envoy, they unanimously approved the plan he drafted. It’s little wonder that leaders in Libya and the region are not supportive of the ‘new’ UN plan for a ‘unity’ government”. The United Nations Security Council’s Resolution 2259 (UNSCR 2259)—passed with the approval of Russia and China, let it be noted—reads as a charter for foreign intervention in Libyan affairs. It demands the Government of National Accord’s “full cooperation with the International Criminal Court and the Prosecutor” (p. 3), while consistently imposing foreign concerns about the oil trade, migrants, and terrorism. UNSCR 2259 not only endorsed the new GNA “as the sole legitimate Government of Libya,” but it also called on all UN member states “to cease support to and official contact with parallel institutions claiming to be the legitimate authority, but which were outside of the Political Agreement”—which effectively means that the GNC has been internationally outlawed, a fact lost on most journalists. The UN mandated that the new GNA be implanted in Tripoli (supposedly without any resistance from GNC militias), with the immediate aim of international support for the GNA being to fight the Islamic State (Daesh), along with Ansar al-Sharia and Al-Qaeda. Any parties acting as “spoilers” would face UN sanctions. And what has been the result? Spoilers. The presidents of Libya’s two rival parliaments immediately and jointly rejected the UN decree. “You will be aware that ignoring the views of the House of Representatives and the General National Congress would fundamentally undermine the very meaning of consensus and its outcomes. Moreover, the violent demonstrations that broke out in Tripoli and numerous other Libyan towns have underscored the lack of consensus regarding the presidential council. The latter is not the product of a Libyan consensus. Rather, it stems from the personal interpretation of the outgoing United Nations envoy, Bernardino León. A government grounded in a genuine, broad-based national consensus would be in a position to confront the crisis facing Libya. A government bereft of such consensus—as is the case of the government announced by UNSMIL—would create serious complications for the situation in Libya”. Malta’s Foreign Minister, George Vella, backed up the Libyan letter, arguing that the threatened imposition of sanctions against Libyans opposed to the UN agreement, would inevitably worsen the situation. It is an extraordinarily bad piece of science fiction that is being sold to the international public here, as suggested by the nature of the remarks made by US Secretary of State, John Kerry: “I urge all Libyans to support this final agreement and to unite behind the Government of National Accord”. That a US official presumes to tell Libyans what they should support and how they should behave, is itself a testament to the fact that the “agreement” on Libya was produced without Libyan agreement. It is a falsehood, a fabrication, a solution that requires force to be made real, and thus inevitably a failed solution. Samantha Power, US ambassador the UN, then added to the fiction by arguing that the “agreement” offers Libya a chance “to reclaim the opportunities first made possible by the February 17th, 2011, revolution”. The noteworthy irony here is that the UN decree displaces the same parties that were recognized and legitimated by the UN in 2011. What most writers have already understood—and at least this point is not in dispute—is that the whole rush by foreign powers to create a puppet government is to legitimate a rush to war in Libya. Western powers, working through the UN, not only want a superficially unified Libya so that they can bomb it, they also want the powers that be to recognize their replacements. That such unvarnished arrogance should pass with so little comment outside of Libya is a disturbing testament to our own numb acquiescence to imperialism. The GNC President announced that Libyans can solve their own problems, with foreign assistance, “but we will not accept foreign intervention against the will of the Libyan people”. One analyst supported this statement, explaining: “A Libyan-drafted and approved peace plan followed by a unified, Libyan-led military force to push the Islamic State out of Libya would be have been best for everyone. But that would have called for patience and support for Libyans to create their own peace for their own country. Unlike resolutions and bombers, resources like patience appear to be in short supply in the West”. Symbolic of the rejection of the UN, the UN’s envoy, Martin Kobler, was humiliated by the GNC authorities in Tripoli when “his press conference was interrupted and told he needed permission to hold it at Mitiga airport”. Kobler, embarrassed, quickly departed. Failed intervention has thus already set about creating a new round of failed intervention. That this should transpire during a US presidential election campaign, with virtually no comment by any of the candidates, is a very bad sign. It is a bad sign first for Libya, and other African states that may be targeted next, and second for US citizens. AFP. (2016a). “US Planning Military Campaign against IS in Libya: Report”. Middle East Eye, January 31. AFP. (2016b). “New Libya Govt Must Have Tripoli HQ: U.N. Envoy”. Al Arabiya, February 1. AFP. (2016c). “Libya MPs Postpone Vote on New Unity Government”. Agence France Presse, February 16. Al-Warfalli, Ayman. (2016). “Libya’s Recognized Parliament Rejects U.N.-Backed Unity Government”. Reuters, January 25. Bush, George H.W. (1990). Address Before a Joint Session of Congress (September 11, 1990). Charlottesville, VA: Miller Center, University of Virginia. Cammack, Paul. (2006). “UN Imperialism: Unleashing Entrepreneurship in the Developing World”. In Colin Mooers, (Ed. ), The New Imperialists: Ideologies of Empire (pp. 229-260). Oxford: OneWorld. Channel News Asia. (2016). “Libya Seeks Extra Week to Form Unity Government under UN Deal”. Channel News Asia, February 9. Charbonneau, Louis. (2015). “U.N. Council Backs Libya Peace Deal, No Western Air Strikes Sought”. Reuters, December 23. Donaghy, Rori. (2016). “UN Envoy ‘Asked Permission’ from UAE to Name Libya PM Candidate”. Middle East Eye, February 16. Editorial. (2016). “Is it Back to Square One in Libya?” Times of Malta, January 29. Eisenhower, Dwight D. (2011 ). “Farewell Radio and Television Address to the American People. January 17, 1961”. In Maximilian C. Forte, (Ed. ), Interventionism, Information Warfare, and the Military-Academic Complex. Montreal: Alert Press. Elise, Labott. (2011). “Syrian Opposition Working to Unify, Get its Act Together”. CNN, August 17. Gouider, Aguila Saleh, & Abu-Sahmain, Nouri Ali. (2015). Letter S/2015/1018, December 22. Libya: House of Representatives and General National Congress. Harissi, Mohamad Ali. (2016) “New Libya Unity Government to be Proposed ‘Within 10 days’”. Agence France Presse, January 26. Hauben, Ronda. (2011). “The Role of the UN Security Council in Unleashing an Illegal War against Libya”. Global Research, July 20. Hearst, David. (2015). “The West Wants Unity in Libya so It can Bomb It”. Middle East Eye, December 16. Kerry, John. (2015). Welcoming the Signing of the Libyan Political Agreement: Press Statement, December 17. Washington, DC: Secretary of State. Ki-moon, Ban. (2012). “Statement Attributable to the Spokesperson for the Secretary-General on the One Year Anniversary of the Revolution in Libya”. UN Secretary General Ban Ki-Moon, February 17. Kirkpatrick, David D. (2015). “Leaked Emirati Emails Could Threaten Peace Talks in Libya”. The New York Times, November 12. MEE. (2015). “Full Text of Email from UN Libya Envoy Bernardino Leon to UAE Foreign Minister”. Middle East Eye, November 5. Michael, Maggie. (2016). “UN Envoy to Libya Says Time Running out, IS Expanding”. Associated Press, February 17. Mills, C. Wright. (1958). “The Structure of Power in American Society.” The British Journal of Sociology, 9(1), 29-41. Mills, C. Wright. (2000 ). The Power Elite (New Edition). Oxford: Oxford University Press. Muntasser, Emadeddin Zahri. (2016). “UN Takes the Wrong Road in Libya”. International Policy Digest, January 5. Pecquet, Julian. (2015). “Emails to Hillary Contradict French Tale on Libya War”. Al-Monitor, June 23. Petré, Christine. (2016). “Little to Celebrate, Say Libyan Youth on the Anniversary of the Revolution”. Middle East Monitor, February 17. Power, Samantha. (2015). Explanation of Vote at the Adoption of UN Security Council Resolution 2259 on Libya. New York: US Permanent Representative to the United Nations, US Mission to the United Nations. Ramesh, Randeep. (2015). “UN Libya Envoy Accepts £1,000-a-day Job from Backer of One Side in Civil War”. The Guardian, November 4. RT. (2015). “ ‘Thanks for Destroying Our Country’: Angry Libyans Lash Out at Obama’s Independence Congratulations”. RT, December 25. Schmitt, Eric. (2016). “Obama is Pressed to Open Military Front against ISIS in Libya”. The New York Times, February 4. Stephen, Chris. (2016). “Libya Unveils UN-Backed Government…Based in Tunisia”. The Guardian, January 19. Times of Malta. (2016). “UN Envoy to Libya ‘Humiliated’, Forced to Leave Libya at Once”. Times of Malta, January 2. Tripoli Post. (2012). “United Nations Support Mission In Libya Welcomes Adoption of Electoral Law”. Tripoli Post, February 9. UN. (2012). “Libya: UN Envoy Envisages Flexible, Integrated Mission to Support Transition”. UN News Centre, March 7. UN. (2015). Unanimously Adopting Resolution 2259 (2015), Security Council Welcomes Signing of Libyan Political Agreement on New Government for Strife-Torn Country. 7598th Meeting, Security Council, December 23, SC/12185. UNDP. (2012). “Building a Sustainable Democracy in Libya”. United Nations Development Program. UNDP. (2014). “Supporting Transition in Libya: Acheivments 2013-2014”. United Nations Development Program. UNSC. (2015). Security Council Resolution 2259, December 22. US Department of State. (2015). Joint Statement on Libya: Media Note, March 21. Washington, DC: Office of the Spokesperson, US Department of State.